How Left-wing Is Jeremy Corbyn? Previous: Are We Willing to Pay any Price? Next: Who Is Jeremy Corbyn? I’m far from on the left of the party but was attracted to the programme Corbyn is putting forward because it relies less on traditional Keynesian deficit spending to challenge the austerity agenda. My point is a political one; you cannot sell Keynesian deficit spending on the doorstep because the public think it is a load of mumbo-jumbo. Its not of course but having an alternative narrative based on QE and clamping down on tax evasion has more chance of selling to voters Labour needs to win power. The Party has tried the road of appeasement of the right of centre politics. We need a clear division between us and the “Party of the Establishment”. Jeremy Corbyn gives us that. Do not underestimate the intelligence of the electorate. Put some fire back into British Politics and maybe, just maybe, we will get a decent turn out at elections. The man has shown his integrity by the manner in which he has conducted himself throughout this (dirty) campaign. You’ve hit the nail squarely and firmly on the head, Bryan. The ignorance of most UK politicians (including Labour ones) on issues such as fractional reserve bank lending and the importance of the current account deficit leaves me despairing for the future. 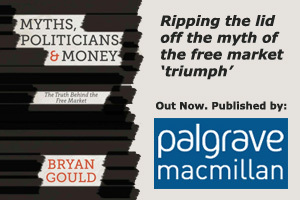 The Positive Money campaign looks as though it might be close to the right track but I don’t hold-out much hope that these critical flaws in our economy will attract much serious mainstream political attention. How ever did we get into this mess? Having an external deficit (I assume you are talking about the balance of trade) isn’t a problem so long as capital is being recirculated by countries running balance of trade surpluses, by way of buying up stocks and government bonds of deficit countries, so as to provide their foreign customers with the means to continue to import their goods. As Varoufakis has pointed out, the process by which the US maintains its trade deficits has broken down, and the global capital recycling patterns are in confusion, with dangerous potential and real consequences. The question must be are the reasons for the UK economy getting away with a long term trade deficit in peril, and what should be done by way of working towards breaking even. As the German abuse of Greece has shown, countries running trade surpluses are unlikely to allow their trade partners to change the terms of that trade if they can prevent it.